Joint pain is the primary symptom associated with osteoarthritis. Any joint can be affected by the disease. Recognizing early symptoms and getting appropriate treatment help to control joint pain and other symptoms. Learn more about how osteoarthritis leads to joint pain and affects the joints in other ways. Knee osteoarthritis is the most common type of osteoarthritis. More than 10 million Americans have knee osteoarthritis. It is also the most common cause of disability in the United States. Early diagnosis and treatment help manage knee osteoarthritis symptoms. Hip osteoarthritis is a common type of osteoarthritis. Since the hip is a weightbearing joint, osteoarthritis can cause significant problems. About 1 in 4 Americans can expect to develop osteoarthritis of the hip during their lifetime. Osteoarthritis can affect the ankle. Three bones make up the ankle joint: the lower end of the tibia (shinbone), the fibula (small bone of the lower leg), and the talus (bone that fits into the socket formed by the tibia and fibula). Osteoarthritis of the foot can be painful and disabling. It can be caused by previous injury or abnormal foot structure. Walking and balance may be affected. 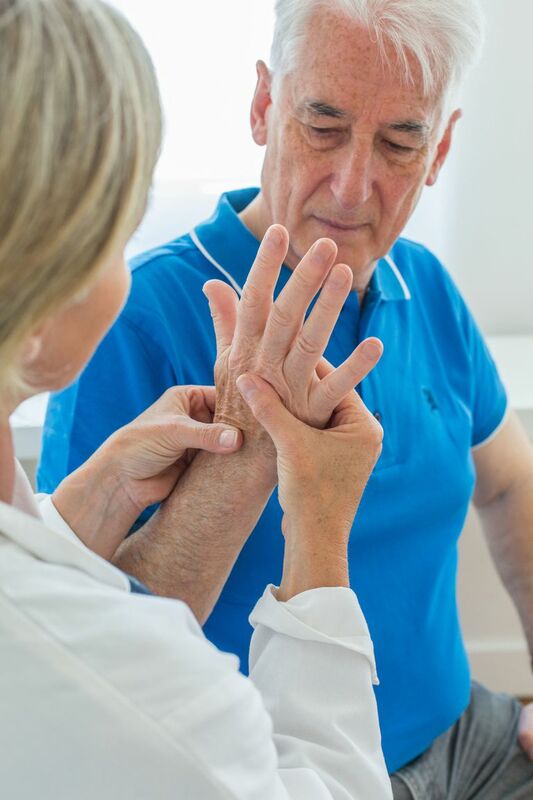 Osteoarthritis of the hand most commonly develops at three sites on the hand -- at the base of the thumb, at the joint closest to the finger tip, and the middle joint of the finger. Early diagnosis and treatment help people with osteoarthritis of the hand manage their symptoms. Finger osteoarthritis is a common condition among postmenopausal women. Finger anatomy is intricate and finger osteoarthritis can be painful and disabling. Stiffness, swelling, and pain are typical symptoms associated with finger osteoarthritis. Thumb osteoarthritis can be painful and can affect normal hand movements, such as pinching and gripping. Stiffness, swelling, and pain are symptoms associated with thumb osteoarthritis. Learn more about the cause, diagnosis, symptoms, and treatment of thumb osteoarthritis. As with any joint affected by osteoarthritis, the primary symptom associated with wrist osteoarthritis is pain. In the early stages of osteoarthritis, pain is brought on by activity. Usually, while performing the activity, pain subsides. Once the activity is stopped, pain and stiffness increase again. Learn more about wrist osteoarthritis. The elbow is actually among the joints that are least affected by osteoarthritis. However, elbow osteoarthritis can be painful and disabling. The ulna and humerus meet at the elbow to form a hinge joint. Neck osteoarthritis, also known as cervical spondylosis, is chronic degeneration of the vertebrae in the cervical region of the spine, as well as the discs between the vertebrae. Neck osteoarthritis typically affects men and women over 40 and progressively worsens with age. Osteoarthritis of the shoulder can affect the two joints in the shoulder area - the acromioclavicular joint and the glenohumeral joint. Learn more about osteoarthritis of the shoulder. Osteoarthritis can affect the spine. Osteoarthritis of the spine occurs when there are degenerative changes in the discs between the vertebrae. Early diagnosis and treatment help people with osteoarthritis of the spine manage their symptoms. Do Osteoarthritis Symptoms Always Develop Gradually?